It goes without saying that you are the company you keep. If this is in fact true, then shouldn’t all the company you keep be good company? Often time and especially in our teenage years, it doesn’t quite happen this way. 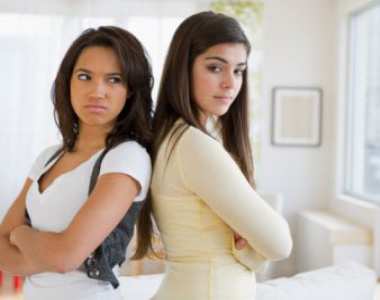 Toxic friendships; friendships that cause more harm than good are all too common amongst teenage social circles. In an effort to avoid disappointment or regret, here are 10 signs you’re in a toxic friendship. 1. Is your friend mean or hurtful to you? If you answered yes, then chances are that person isn’t your friend. Someone who cares about you AND respects you would never intentionally do/say things that are mean and hurtful to you. 2. Is your friend abusive (emotionally or physically) to you? Anyone who abuses another person is a bully. And bullying, no matter the relationship is never okay. Think about it, why would you allow someone to treat you that way? Why would you even consider that person a friend? 3. Is your friend untruthful to you? If they’re constantly telling you lies then it’s time to reevaluate the friendship. Honesty is one of the most important qualities a friend should have. If you feel you cannot trust your friend, or you feel as if you’re the one who’s not trustworthy because all they do is tell you lies, I’d suggest calling it quits. 5. Does your friend make you feel like everything between you two is a competition? If you’re friend is constantly trying to one-up you, most likely they feel that they’re either better than you or need to be. It might even be jealousy. Say you got a good grade on a paper you wrote-if your friend’s grade was better than yours, they might purposely brag about it to you and everyone else. Competing with a friend proves that they don’t view you as equals, and a friendship should be nothing but that. 7. Is your friend supportive? Will they be there when you need them? Being a friend means being a support system to someone else. In a time of need, can you truly count on your friend to be there for you? If you can’t answer that question or you can and the answer is no…again, why are they still your friend? A true friend will be there without you having to ask. 8. Do you feel ignored or neglected in the friendship? If the other person starts to ignore/neglect you or plans that the two of you made together, it’s a sure sign that the friendship isn’t as important to them. Value should be placed on the time that people spend together, so if a friend begins to spend less time with you it should be an indicator that they don’t value you the way they should. 9. Have you found yourself the subject of gossip spread by your so-called friend? Being talked about behind your back is bad enough, being talked about behind your back by someone you thought you could trust is even worse. Gossip and rumors are synonymous with teenage years, but if you’re able to avoid the drama by nixing that friendship, then I applaud you. 10. Is your friendship one-sided? Meaning, you’re the only one who’s being/been a friend to the other. If you answered yes to that or any of the other questions, then all bets are off. Any successful relationship requires two people. If the other person in question can’t see that, then they obviously weren’t worthy of your friendship to begin with. For a friendship to work, it should be based on loyalty, respect, trustworthiness and support. Think of those aspects as pieces to a puzzle- if you’re missing one, then it’s incomplete. Now apply that to your friendship. Realizing your worth is one of the first things you can do to avoid a toxic friendship.